Chris Herring Heat & Air is proud to serve the Tupelo community! About Tupelo, MS - Happy to be your hometown Heating & Air Conditioning Contractor! Tupelo is the largest city and county seat of Lee County, Mississippi. This community is situated between Birmingham, AL, and Memphis, TN, and it is the seventh largest city in Mississippi by population. 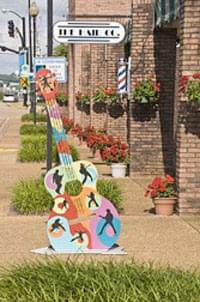 The city itself has nearly 35,000 residents, and it is best known as being the birthplace of the legendary Elvis Presley. Tupelo is the headquarters for several different industries that bring jobs to the area, including the North Mississippi Medical Center, BancorpSouth, and Renasant, and satellite campuses of the Mississippi University for Women, the University of Mississippi, and Itawamba Community College are located in the city. Tupelo is home to several area attractions and sites of interest. There are several historical destinations within this community, including the Brices Cross Roads national battlefield, which was fought during the Civil War. Families with children may prefer an afternoon at the Tupelo Buffalo Park and Zoo, which features a variety of unique animals. Other notable attractions in the area include the Tupelo Automobile Museum, the Tupelo Community Theatre, and the North Mississippi Symphony Orchestra. The weather in Tupelo is varied throughout the year. Winter temperatures are chilly to mild, but freezing temperatures do occur sporadically throughout the season. Snow and freezing rain can also spring up during these times, and when the frigid weather arrives, residents are happy to have a reliable heat pump or furnace to use. During the summer months, Tupelo and the surrounding communities are well known for experiencing severe weather. One of the worst-ever natural disasters to strike the U.S. was the 1936 Tupelo Tornado, which killed over 200 people. The area is subject to frequent tornadoes and thunderstorms that can result in damage and injuries, and residents rely on their air conditioning systems to keep their interior environments comfortable and safe when severe weather keeps them indoors.